Andy became a famous chef after he studied cooking in Paris. He won a scholarship to study at the University of Hawaii. 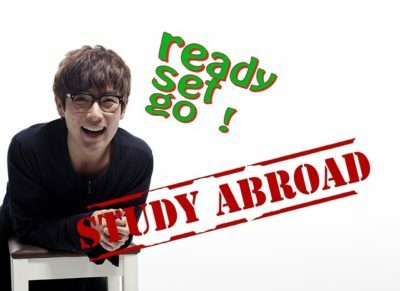 He went to Germany with a view to studying medicine. He’s an overseas student from Japan. I am no less anxious than you to study abroad. I became painfully aware of my lack of vocabulary when I came here. It’s fun getting to know students from around the world. I’ve become homesick for Japanese food, since all I’ve been eating is fast food. My brother won a scholarship which enabled him to go to college abroad. My dream of studying in Japan at last came true. My English probably would have gotten better if I’d done a homestay. She owes her fluency in English to having studied in the United States. She went to Britain for the purpose of studying Shakespeare. She went to Germany to study music. The first three months were terrible because I wasn’t used to the food. Your English will never improve if you just hang around in groups of other Japanese.